Remembering is a practical skill. It's part of our daily routines (e.g. 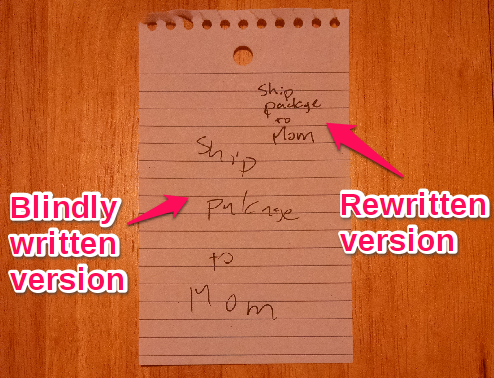 remembering a grocery list, remembering to ship a package). While it might sound like we are discussing unlearning, we are not. Unlearning means removing something entirely from your memory. 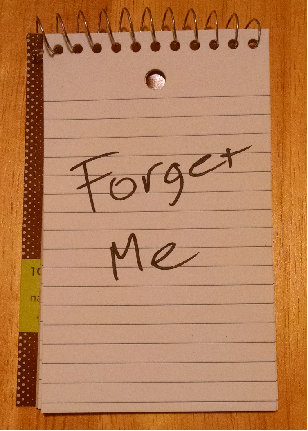 Forgetting means placing something to a less active part of our memory. This is a canonical example of practical forgetting. We have a list of things we want to remember for a later time but it's impractical to keep on thinking about them now. These can be tasks (e.g. visiting the doctor, writing a blog post) or tangible items (e.g. buying specific groceries). In these solutions, the medium can vary depending on the situation (e.g. electronic is good for reuse/sharing, paper is good for attaching to a specific location like a desk). When falling asleep, sometimes I have epiphanies about the past day or upcoming tasks. No matter how hard I try, I almost always forget these when I wake up. Additionally, if I begin to think about finer details, then I start to lose track of the original thought and lose everything. Once the thought has been written down, I let my mind drift and it begins to think about other topics. If I think of something else that I want to remember, then I write it down again. Note: Perform this in the dark and with a notepad because any light will stop melatonin production and prolong not falling asleep. In the morning, I read the note and the thought rushes back into memory. Then, I rewrite it (usually it has some typos or scribbles), and then consider this note as the same from our "Remembering an item" section. Rewrite the note in as soon as you wake up. Thoughts that seem fresh now might be lost later (kind of like with remembering dreams). Whenever I leave the house, I usually bring a pen. Sometimes I find myself in a situation where writing a note via pen on my wrist is my best option at the time. Whenever I had a fleeting thought that I know I am going to forget shortly due to other larger tasks, I always take time to write it down. Thinking about work tasks while you are in your personal life can be unnecessarily stressful. Often they are tasks that you are unable to do at the moment and you already know what needs to be done. As a result, I try my best to keep personal things personal and work things for work. Always do something between them. For me, I sleep my computer and go get dinner or take a walk. When I was taking a break in Japan, I did my best to step away from programming as much as possible. There were a few open source issues that snuck through but when handling them, I noticed a few things. When I got back and resumed programming normally, it took a couple of days to get back into the swing of things.